Big League Chew Swingin' Sour Apple will have you swingin' for the fence in no time. Open the stay fresh foil pouch, grab a big gob and stuff it in your mouth! 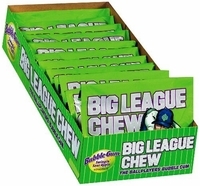 The Big League flavor will get you all charged up and ready to launch one past the warning track. Long lasting flavor will keep you going into extra innings. Swingin Sour Apple is a Home Run for your taste buds.